The Lloyd Expressway is the main west-east artery across Evansville, Indiana. It is named for Russell G. Lloyd, who served as mayor from 1972 to 1980 and was assassinated soon after leaving office. It is a four to six lane expressway that links the east and west sides of the city with downtown. The highway runs for about 14 miles from the Warrick-Vanderburgh County line to the Posey-Vanderburgh County line. The highway carries Indiana 62 and Indiana 66 along its route. The highway originally existed primarily as a one-way pair of streets named Pennsylvania Street and Division Street. Pennsylvania Street was the road west of Main Street (in the center of Evansville) while Division Street was the name of the road to the east, all the way to Warrick County. Pennsylvania Street was the original Indiana 62 while Division Street was the original Indiana 66. Today, Indiana 62 carries the Lloyd Expressway from the Posey County line east to U.S. 41. Indiana 66 carries the expressway from U.S. 41 east to the Warrick County line, and ultimately Interstate 164. Diamond Avenue (Indiana 66) and Morgan Avenue (Indiana 62) to the north carry the state highways in the opposite directions from U.S. 41, allowing for Indiana 62 to go from southwest to northeast and Indiana 66 from northwest to southeast. Largely because of the differences in state highway designations, the highway is among the few in Indiana to be referred to by name, usually named by residents as "the Lloyd." Starting in the 1950s, the expressway was built in segments up until its official opening in 1988. The western section of expressway was the first built, and the design of that segment shows. Later on, additional segments to the east were constructed as the expressway was built through the heart of the city. By 1988, the most substantial parts of the expressway were finished. 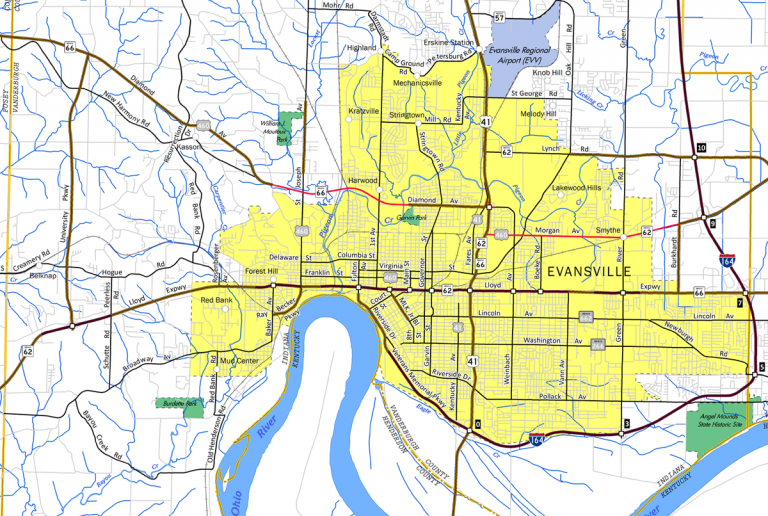 Residents of the Evansville area joke that the expressway is anything but express, contrary to the fact that the highway was never designated a freeway, meaning that its name was accurate. Common misconceptions about the differences between a freeway and an expressway have helped to fuel this belief about the Lloyd. It is also a common excuse for one to be late by getting stuck in traffic along the Lloyd, especially at the western and eastern ends of the expressway. Still, few in Evansville will want to go back to the old ways of following Division and Pennsylvania across the city, so for what it&apos;s worth, the Lloyd Expressway does work. The future calls for few improvements to the highway, primarily paving work on the western end and the interchange with U.S. 41. But lack of funding has pushed the conversion of the rest of the highway into a freeway into doubt. Southbound University Parkway, just north of the University of Southern Indiana campus, a guide sign directs traffic onto the Lloyd Expressway (Indiana 62) via the control cities of Mount Vernon (to the west) and Evansville (to the east). Photo taken 03/06/10. On southbound University Parkway, at the diamond interchange with the Lloyd Expressway. Out here, the control city of Evansville is acceptable since the city limits are still a few miles to the east. Photo taken 03/06/10. A guide sign for the Lloyd Expressway on-ramp from Division Street at the downtown. Throughout the city, the control city for the Lloyd Expressway is simply the name of the highway. Photo taken 10/12/08. A view of Division Street in Downtown Evansville with the Lloyd Expressway to the left. Division Street facilitates westbound traffic to and from the expressway. Photo taken 10/12/08. A view of the John Street off ramp from the Lloyd Expressway eastbound. John Street facilitates the eastbound movements through Downtown Evansville to and from the expressway. Photo taken 10/12/08. A diamond interchange joins Weinbach Avenue with Indiana 66 (Lloyd Expressway). Division Street constitutes a westbound side service road to the state road to provide access to the westbound direction of the Lloyd Expressway. This junction was made busier as part of a route to Roberts Municipal Stadium, home of the University of Evansville Purple Aces basketball until 2011. A new sports and entertainment venue for Evansville, the Ford Center, opened for use in 2011 at the corner of Martin Luther King, Jr. Boulevard and Sycamore Street in downtown. Photo taken 05/27/11. Passing underneath Lloyd Expressway, drivers bound for Indiana 66 east to Eastland Mall and Interstate 164 depart Weinbach Avenue for the state road directly. Weinbach Avenue continues south to the University of Evansville campus and residential areas beyond. Photo taken 05/27/11.